The removable drone valve has a flexible connector for connection to the drone stock. It also features a screw adjustable quick stop drone valve to regulate the air flow. Drone valves are included within the system. These are removable if not needed, however they will regulate the air flow to the drones giving a steadier drone sound. The Ross canister system provides excellent moisture control through drying granules. The amount of moisture getting to the reeds can be regulated by rotating the colour coded airflow rings or by adjusting the quantity of drying granules in the canister. he perfect device for your sheepskin/hide bag etc. Joins to your existing tube and can slip through a split stock. This can also be adapted into other Moisture Control Systems for use in zip bags. The Trap Dri moisture control trap has been developed to prevent excess water escaping from your water trap and saturating your pipe bag. The trap works by collecting water which condenses inside your water trap tube and locks it inside the Trap Dri. Give your pipes the treatment they deserve by purchasing this revolutionary new trap which never loses its effectiveness during use. Turns the Full Synthetic Bottle System into an all out moisture control system for all playing conditions. Kit includes a silica gel and standard tube changeable ends which can be easily changed by swapping out the bottle end at the mid joint in the system. The silica gel end makes use of multi airflow to distribute air evenly across more of the silica gel to obtain maximum drying power from the silica gel resulting in far superior performance. Ideal for all weather conditions, easily allowing you to increase or decrease moisture as required.Turns the Full Synthetic Bottle System into an all out moisture control system for all playing conditions. Kit includes a silica gel and standard tube changeable ends which can be easily changed by swapping out the bottle end at the mid joint in the system. The silica gel end makes use of multi airflow to distribute air evenly across more of the silica gel to obtain maximum drying power from the silica gel resulting in far superior performance. 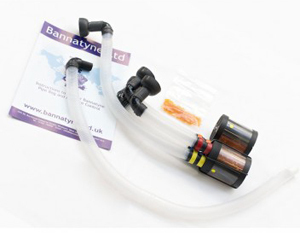 System Description - Air is taken through the gel filled cartridge section, on through the flexi-tube and connects to the chanter stock. For extended playing time, combine the chanter moisture control system with the drone moisture control system and play until you give in rather than your bagpipe! A silica gel based moisture control system giving longer playing time, excellant airflow, no restriction to chanter reed, great starts and stops, easy to install with direct connection to stocks, easily adjustable to suit any climate and easily adjustable to suit wet or dry blower. Comes complete with spare cannister and extra gels. The David Naill watertap is an excellent product for non-zipper pipe bags and takes up very little space within the Bagpipe pipe bag. It consists of a Plastic tube that is inserted inside the blowstick stock from the outside. A tool is included to widen the end, and a special compression ring holds the watertrap in place. It can cut to fit any bag and has a metal coil to stop kinking.